Vi Wickam has created a new Fiddle Lesson for the Scottish tune Miss McLeod’s Reel. that he and I like to play in our duo Fiddle Whamdiddle. I have already created a mountain dulcimer lesson in the Galax style for this tune on DulcimerCrossing here. And Steve playing Galax style with Vi and another DulcimerCrossing teacher, Don Pedi, at a house concert at Steve’s former home in Fort Collins, Colorado. As always, you can become a subscriber at DulcimerCrossing.com and have complete 24/7 access to all of our lessons! We are pleased to share a new Fiddle Lesson by Vi Wickam from mytalentforge.com. This is a tune that he and I play on our Old-School Old Time recording because it is one of the first tunes that we both learned in a traditional style. This lesson set features the Single or Common Shuffle bowing technique and a demonstration of what happens when a “singing song” gets transformed into a fiddle tune. Enjoy this sample lesson and subscribe to have access to this and all of the lessons from our skilled and respected instructors! The Barlow knife design dates back 400 years, and is a type of folding pocket knife that features double or single blades that open at one end only. The knife-style bears the name of a man named Barlow of Sheffield, England, one of the earliest and most famous makers. This knife has been in the back pocket of Americans since the beginning, and its dependable design and minimalistic features make it a classic to own. Fifty years ago, you could buy one for $2.00, but they cost quite a bit more today. The song about the Barlow knife is an old-time southern Appalachian tune that is credited to the music of Henry Reed (Glen Lyn, VA), who called the tune “Cabin Creek,” and Franklin George (Bluefield, WV), who knew it as Barlow Knife. The tune is usually played as an instrumental, with perhaps one verse only sung. In this lesson, Steve Eulberg teaches hammered dulcimer players how to play the melody, backup, and harmony for Barlow Knife. 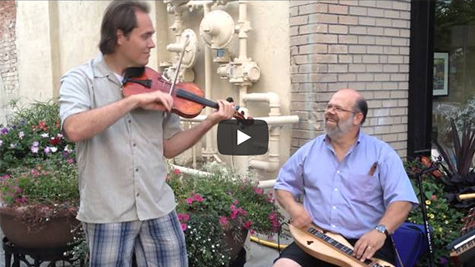 Enjoy this video with Vi “The Fiddler” Wickam and Steve Eulberg playing Barlow Knife together. You can clearly hear the twin harmony in the arrangement. Barlow Knife is included on their Fiddle Whamdiddle CD.